This homemade biscuit recipe is my personal favorite and when I prepare them they look feel, and taste just like Grandma's. 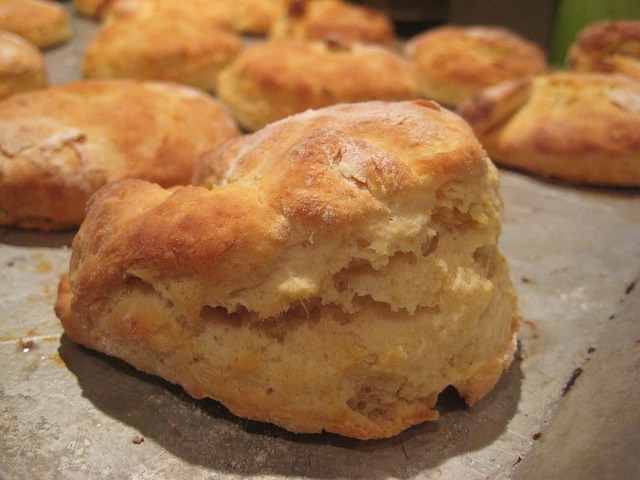 In my opinion, if your serving any type of meat such as country ham, bacon, or sausage, no breakfast meal is complete without baking up some fresh homemade biscuits. How do you like you eat your biscuits? Sometimes I will simple pour some syrup over my biscuits and eat them that way. Other times I'll eat biscuits straight out of the oven while they're still good and hot. When I have time to eat a full breakfast, I just split my biscuit open and add my favorite toppings like butter and jelly. On my lazy mornings I usually just make myself a sausage, egg, and cheese biscuit. You could also substitute either ham or bacon for the sausage. Here is the biscuit recipe. In a small mixing bowl, mix together pastry flour, baking powder, and salt. Next pour in some milk and vegetable oil and stir until dough forms. Roll the dough out on a cutting board to about 3/4 inches thick. Cut dough into biscuits using a cookie cutter. Light grease a cookie sheet with cooking spray then place your biscuits on the cookie sheet. Spread the biscuits out on the sheet so that they do not touch. Bake biscuits on the center oven rack at 350 degrees Fahrenheit for 15 to 20 minutes, until golden brown. Serve biscuits with your other favorite breakfast foods.